Watch as Gene Osborn walks you step by step through the process of forge welding cable Damascus. He will show you techniques that will allow you to "work smarter, not harder". 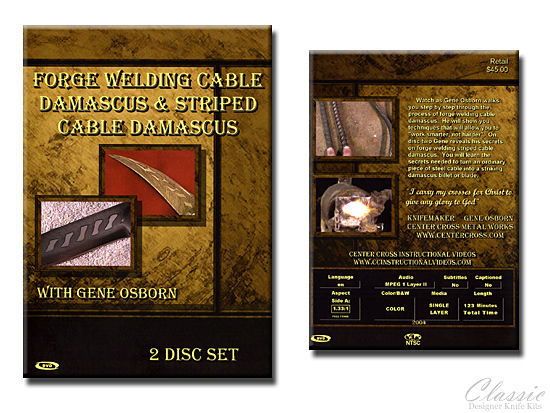 On disc two Gene reveals his secrets on forge welding striped cable Damascus. You will learn the secrets needed to turn an ordinary piece of steel cable into a striking Damascus billet or blade. Our DVD's are DVD-R disc's. In order to view our DVD's, you must have a DVD-R compatible DVD player. Before you purchase our DVD's, please be sure that your DVD player is DVD-R compatible.